Click on this link for a preview of our photo-book of the tour. The link will take you to a PDF file which you can download and view on your computer. own copy or view the book online. 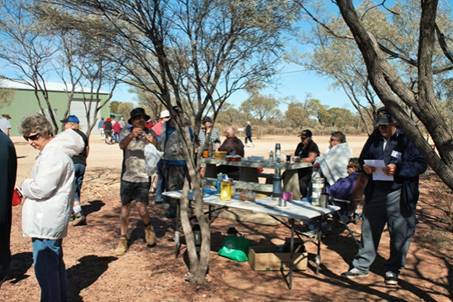 Below is a review of the 2015 TAG-ALONG TOUR from Miles to The Red Centre. Here are some photos that I hope will give you some idea of what we have been up to and just what a wonderful time we have been having. 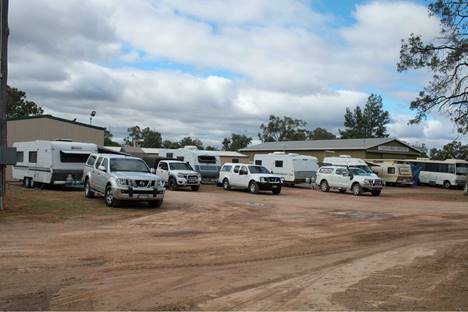 Some of the 48 vans gathering at Miles Showground as we prepare for our meet and greet and our first show tomorrow night at the Miles Memorial Club. This show is special for me, not only is it the first show of the tour, but it is at a club where I worked as a young man for several years back in the late 70’s. My time in Miles taught me a lot about being an entertainer. Great memories. Trevor Tolton, my lead guitarist for the tour and I are gaining quite a reputation amongst our tag-along members for our guitar duos. 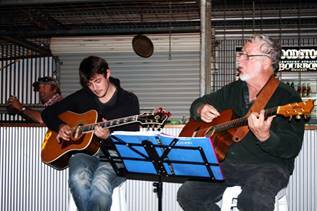 Trevor is still a very young man at 23, but he has a huge future in front of him as he is rapidly developing into a very fine guitarist. He is very popular with all our audiences as they recognise his special talent. It is my privilege to work with him. Saturday morning saw us leave Miles and head to Mitchell for a concert that evening. This photo is a small part of our contingency. Mitchell, along with the Shire Hall at Tambo, acoustically is probably amongst the best halls to be found anywhere in outback Qld. I think both halls were built in the timeframe between the wars and are wonderful examples of older Australian architecture. This is a photo of Trevor and I doing one of our duets as we played “Apache”. The response from the audience was so strong, it encouraged us to include a lot more guitar work in the concerts that followed. 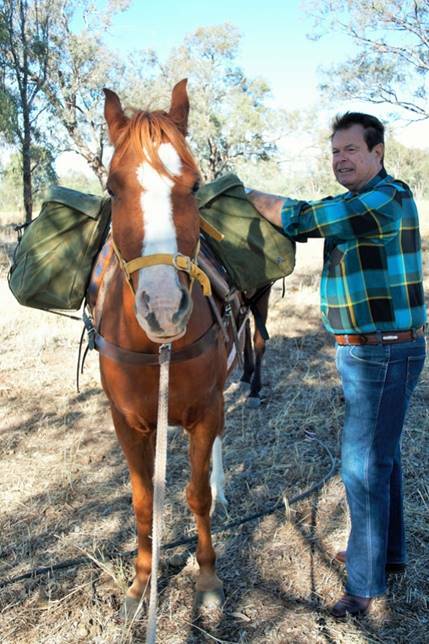 Tamworth, Brisbane, Nanango or Mitchell; some things never change and hopefully never will. 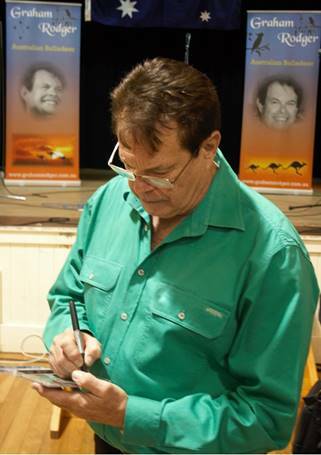 The locals have been thoroughly enjoying our concerts and are keen to take some of the music home, hence the signing sessions. Laura Downing and Rob Hopkins. 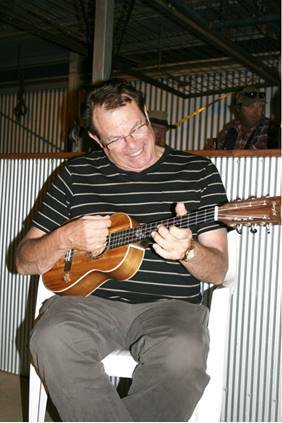 Since leaving the east we have been travelling with some wonderful people on our tag-along and they in turn have been entertained by some great musos. The depth of quality added to our sound by my lead guitarist, Trevor Tolton has been fabulous. 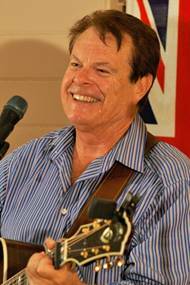 Australia’s rival to the tones of Johnny Cash come alive nightly on our stage from the vocal chords of Rob Hopkins. Laura Downing completes my support team, her singing, yodelling and comedy all roll into one brilliant package that has no equal. Add Deirdre into the mix with her harmonising, humour and organisation and we have a team which is combining brilliantly as an entertaining troop. My Thanks to them all. 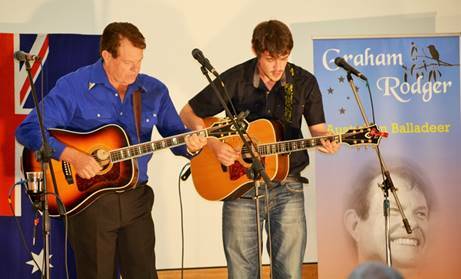 Sunday, day 3 of our tour and two very successful shows under our belt we travelled to Charleville. 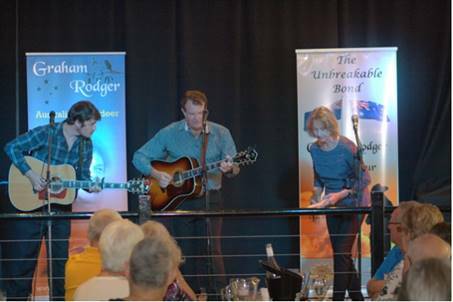 The concert was held at the local RSL Club and we did a tribute show to our ANZACS heavily featuring my latest album – They Answered The Call. An odd tear was shed, a lot of emotion felt and I could not have been more pleased with the homage we paid to our serviced men and women acknowledging 100 years of dedication to our country. Day four was a rest day with no concert. A fascinating morning was spent with Sarah, a local identity who has been an active drover of sheep, cattle or horses for over 40 years. We discovered that modern technology has come to everything including droving. Sarah will often drive a herd for up to 3-4 months totally on her own, something that in decades past may have proven dangerous, if not fatal. In today’s world however, she has somebody watching over her 24-7. The tracking offered by today’s satellite systems have to be seen to be believed. Even the food which will sustain her for 3-4 months is all scientifically prepared. With the exception of water, 4 months food supply packs neatly into two medium size saddle bags placed on the back of her pack horse. Meat, vegies and fruit that form the basis of a well-balanced diet are dehydrated and cryovaced for easy transport. It is very much a different world to 40 years ago when Sarah first started droving. 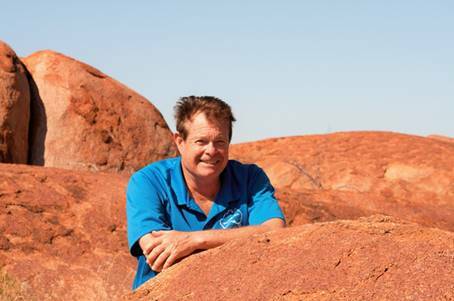 It was an incredibly interesting morning, you don’t come across a female drover with 40 years experience very often. I am sure that sometime soon the experiences of that morning will find themselves into a song. Monday was a free day giving our tag-alongers an opportunity to enjoy many of the wonderful aspects of Charleville. 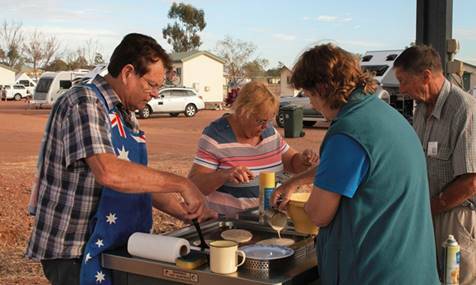 Monday night we congregated at the camp kitchen of the Evening Star Caravan Park. After a very enjoyable dinner my three colleagues and I organised an impromptu concert and sing along. It was an evening thoroughly enjoyed by all. Thursday morning we headed to Tambo for No.4 of our 15 concerts. As previously mentioned, we performed in an old but very beautiful, well maintained local Shire Hall and concert No.4 was classified with the previous three as “a great night had by all”. 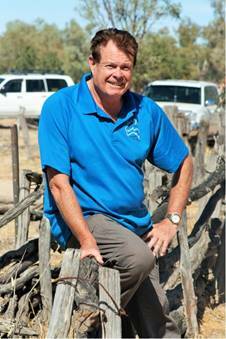 As experienced in Miles, Mitchell and Charleville, the Tambo locals were very free with their compliments. 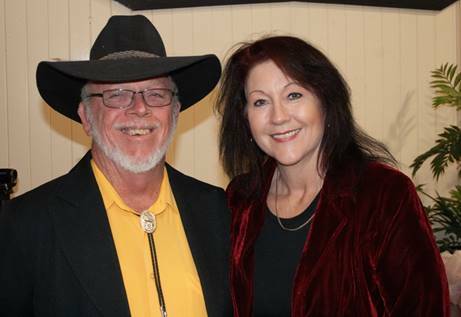 It was becoming very obvious that good quality country music performances were a rare luxury to people living on outback Qld. Tuesday morning we packed up and headed for Yaraka via Blackall. 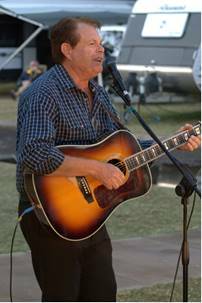 Stewart Benson, my inspiration for the ballad “He’s Droving Once Again” organised a great stopover in the park next to the information centre at Blackall. The real deal, i.e. 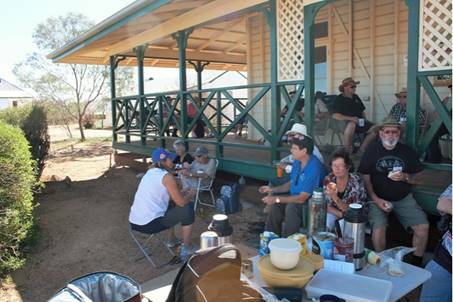 Billy Tea and Damper was served up for morning tea, after which Stewart gave a talk and put on a display of horsemanship. Believe it or not, some of the tag-alongers had their first taste of genuine Billy Tea. During our stay at Yaraka we were treated like royalty, the locals could not do enough for us. Our first night was a concert night. 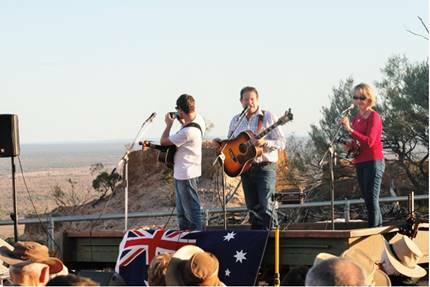 The performance was held on Mount Slocombe, a jump-up with brilliant views of the surrounding district just 6km out of town. The concert was timed to finish as the sun set and this capped off an unbelievable four hours on top of the jump-up. Concert N0.5 was once again different to the previous four, and very memorable to all who were there. My thanks to my touring colleagues for the wonderful contribution they made to a very special evening. 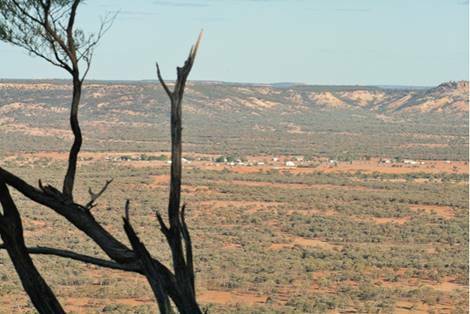 The view from Mt Slocombe overlooking the small township of Yaraka. The view from the top was unbelievably beautiful. However other facilities were very basic. 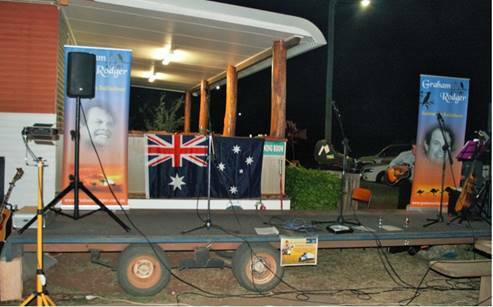 As you can see in this photo, our stage was on a trailer, but the simplicity added to the atmosphere. After the show on Mount Slocombe we were back down in the town to where the locals turned on the hospitality once more as we all shared a meal in the Progress Hall. After dinner the friendly jostling and rivalry was on for one and all as we watched the first State of Origin match. 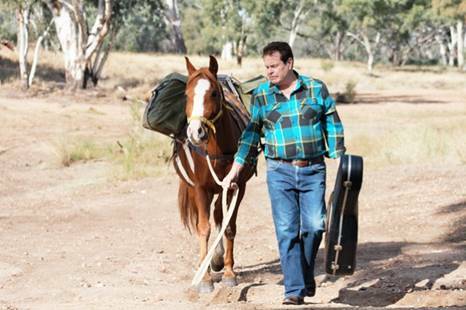 The next day there was to be no concert and Nick, the local publican took us out on tour through some heart wrenching scenery on a property just out of town. 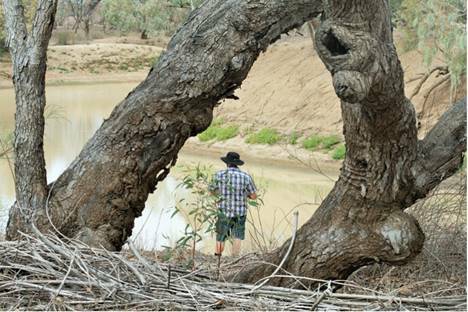 The drought is so bad in outback Qld, it needs to be seen to be believed. Above is a picture of one of the many kangaroos out here competing with stock for what little feed there is. 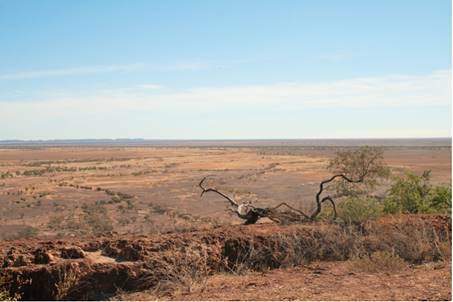 As you can see in the photo the task of finding something to eat is very difficult, even maybe impossible for the ‘roos and cattle alike. 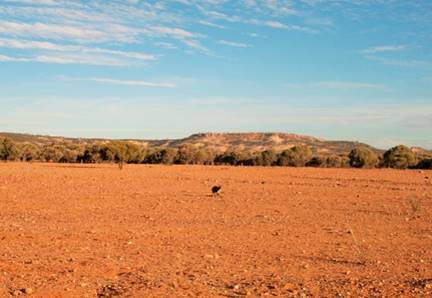 Don’t be put off by the drought conditions, if you get the opportunity to visit Yaraka, grab it with both hands – you will not be sorry! 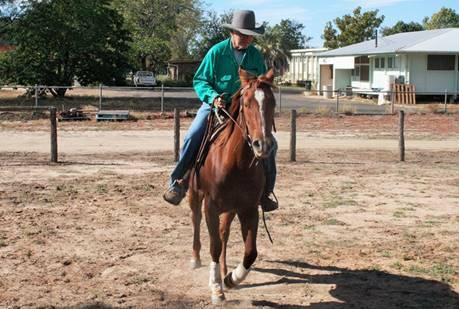 On the morning of the 28th we travelled down to Windorah, a small but beautiful town on the banks of Cooper Creek. 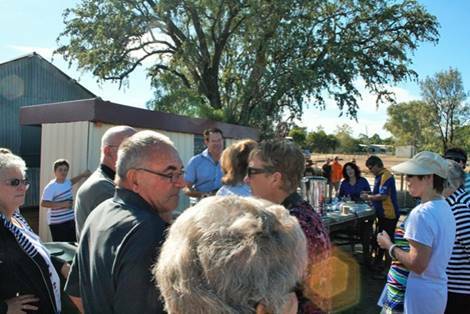 Windorah was on our tour in 2014 and a huge success. Consequently there was a buzz of excitement in town as the locals were anticipating our return. There is no hall suitable for our type of concert, so by necessity it was a makeshift stage on another trailer in the grounds of the Western Star pub. 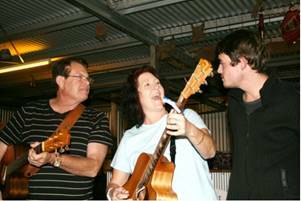 The residents of Windorah don’t get the opportunity to enjoy live music very often and certainly make the most of it when the opportunity arises. 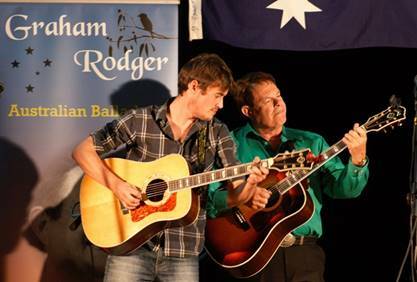 As in 2014 the first part of the concert was very traditional country music ballads but in the latter stages we did our best to give them exactly what they wanted. People were up and dancing and having a ball. Concert No. 6 was another great success and certainly one very different to the earlier five. 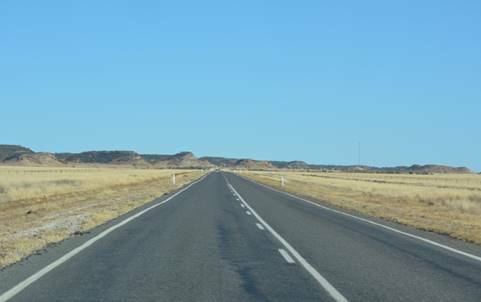 Saturday we travelled from Windorah up to Longreach. After a long drive we all enjoyed a quiet evening. Sunday morning however, we were all up bright and early to enjoy a pancake breakfast. I impressed all with my culinary skills. Even with a few good helpers cooking a pancake breakfast for ninety hungry tag-alongers is no easy task, but I was assured by all that my efforts were worthwhile and that the pancakes were yummy! 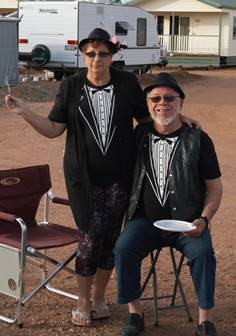 Our breakfast of course was a formal affair as demonstrated by the attire of Rob and Cheryl Hopkins. 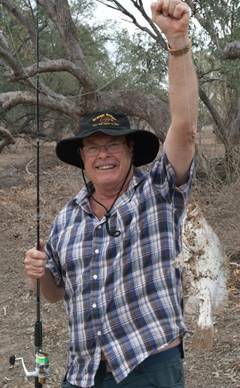 After the breakfast I gathered together the fishermen of the group and we went to try our luck at one of the major water holes just out of town. It was not only a very beautiful spot in the bush, but it actually had a few fish in it. Between us we landed seven good size Yellow Bellies. This is one of three that I contributed to the pot. 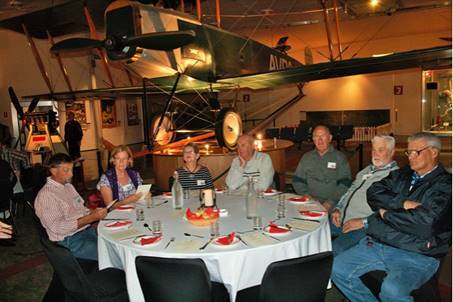 Monday was an opportunity for our tag-alongers to enjoy a wonderful concert at the Qantas Founders Museum. We started at 6pm with a private dinner for our caravaners, then at 7.15 the doors were opened to the general public to join us for concert number 7. 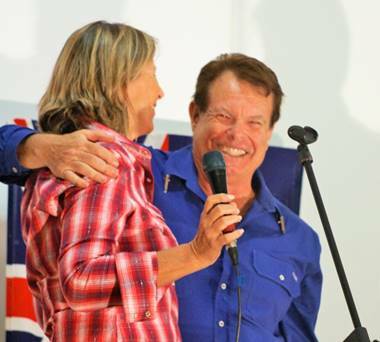 This was to be Laura’ Downing’s last performance with us as she had to return to Brisbane. However, Laurel Calvert was waiting in the wings to take her place for the rest of the tour. Our next stop was Winton. For a twist of nostalgia, concert number 8 was held in an old open air picture theatre, complete with canvas deck chairs. You can just make out the chairs at the back of this photo. 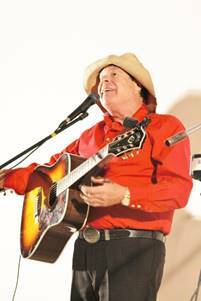 Country music concerts certainly lend themselves to be performed under the stars. As you can see by the photo, we had a very special guest as Chad Morgan’s twin brother joined us for a guest appearance on the show. Wednesday morning I changed hats and became a tourist guide, taking the tag-along mob to a jump-up for spectacular views and morning tea and then we went to Bladensburg National Park. 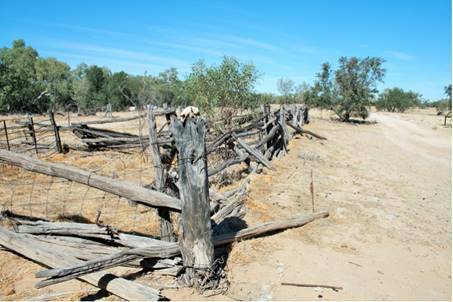 A hundred years ago this was a very productive property, mainly with sheep but one too many droughts forced its closure. Fortunately the government have stepped in and ensured the upkeep of the old homestead, woolshed etc. so that future generations can gain an insight and understanding into the early days of our wool industry. A view from the top of the jump-up. The old sheep pens outside the shearing shed at Bladensburg. 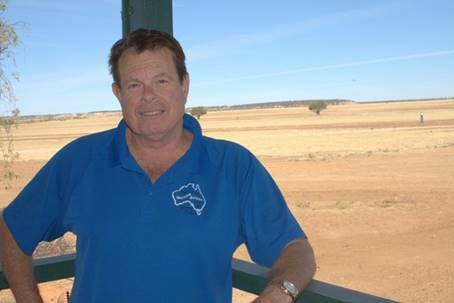 Just to prove that I was there, here I am sitting on the fence of the old sheep yards. Some of our group enjoying lunch on the veranda and grounds of the old Bladensburg Homestead. 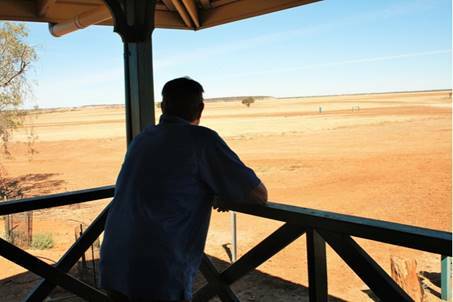 In years of drought it’s hard to imagine the farmer standing, leaning on the rail looking as far as the eye can see without seeing as much as one blade of grass. 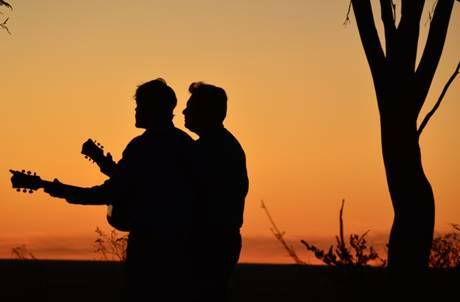 On our last evening in Winton, photographer John Elliott, now a resident of Winton, was kind enough to take us to a Jump-up just out of town on a private property to watch the sun set. It truly was an absolutely wonderful experience. It reminded us of some of the many things which make this country so special. 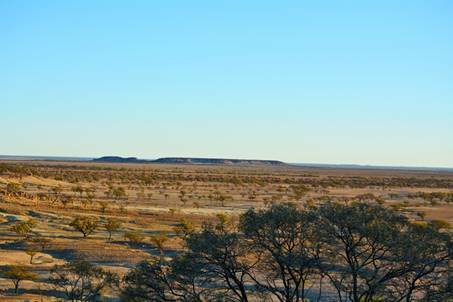 A view from the top of the Jump-up looking out over the plains just on dusk. Two good friends sharing a special moment. 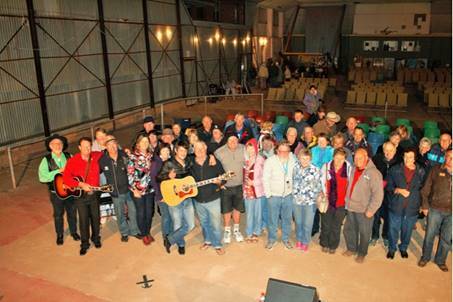 Everybody up bright and early on Friday morning as we all hit the road and head for Cloncurry, our town for concert No.9. 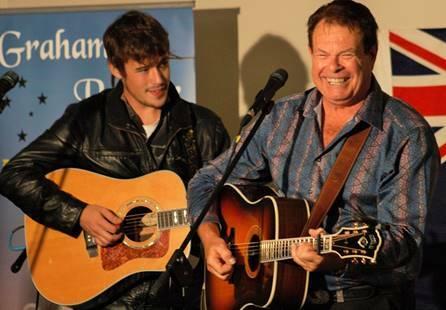 Trevor and I in one of our many guitar duets that became a regular and very popular aspect in many of our concerts. Any of you who have not heard Trevor play since before tag-a-long no1, some 14 months ago, are in for a real treat. In just those few months musically Trevor has grown from a boy to a man. You might be wondering what I am doing and why I would include what is a pretty average sort of photo! However, I was actually doing something very special. In singing “Stronger for it All” with Laurel Calvert, for the first time ever in my career, I sang without my security blanket as my guitar lay on the floor. It was a significant moment that did not escape the majority of the audience. Ken has really captured the moment in this photo. I had just finished my duet with Laurel, my first ballad without my guitar. Despite my many years of stage experience, I was nervous and very pleased when it was all over. 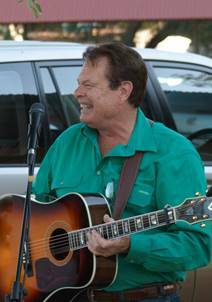 Saturday morning we were on the road again heading for Mount Isa and for what we were anticipating would be a very special concert. 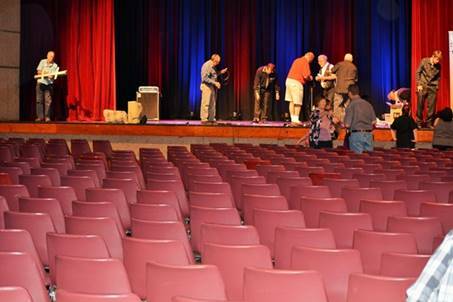 Our venue was to be the Mount Isa Civic Centre, probably the best venue in outback Qld and the Brothers 3 were flying up from Sydney to join me on stage for just this one performance. 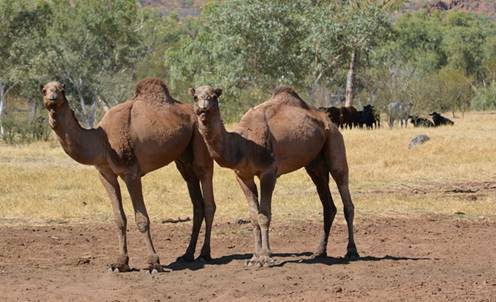 On route we came across several small herds of camels happily sharing the paddocks with the domestic cattle. This picture taken as we set up for the concert. It shows only a small portion of the hall but it does give you a basic idea of how impressive it is. 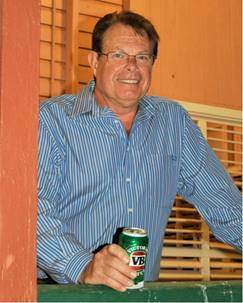 The Mount Isa local Mayor, Tony McGrady, called back stage to extend a warm country welcome to the boys, myself and the rest of the team. 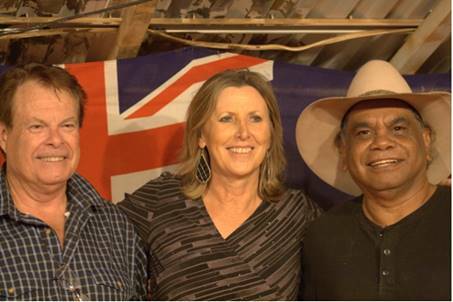 From Mount Isa we headed for Camooweal, one of Slim Dusty’s favourite outback towns. Our venue was another one of these between the wars architecture, acoustics were good and it was a pleasure to perform in it. It was set in a lovely grassed area and the big veranda around 2 sides made it very impressive. In this photo I am on the side veranda enjoying a quiet beer and my surroundings. At concert No.11 we were paid a special visit by Slim himself. Four out of 5 photos that Ken is taking of me, I have a great big grin from ear to ear on my face. I guess it’s an indication of just how much I am enjoying myself. 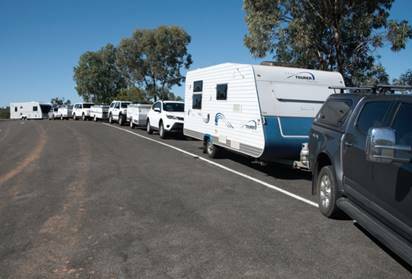 I am not the only one, the indications are strong that everybody on tour is enjoying a great outback experience. We have a huge and fabulous back yard in which to play and the tag-alongers and I are doing just that. 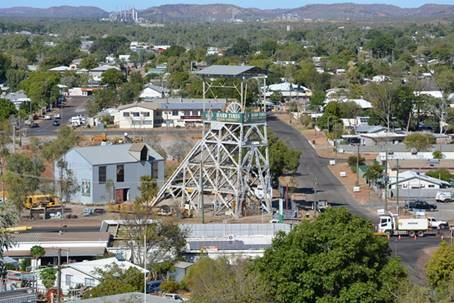 Two nights at Tennant Creek gave our tag-alongers a good chance to check out the tourist attractions. 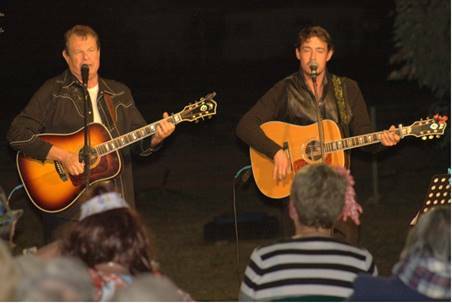 Due to the Memorial Club double booking, we had no formal concert there so we decided to do a free ‘everybody welcome’ casual concert in the caravan park. This proved very popular and was thoroughly enjoyed by the entertainers, the tag-alongers and the other travellers in the park. The setting we were in to do the concert added to the pleasure. 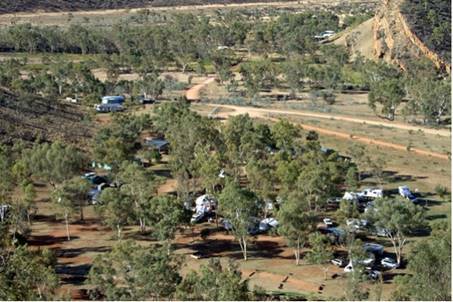 After two days at Tennant Creek we headed to Wycliffe Well Caravan Park which is freely advertised as the Alien Capital of Australia. 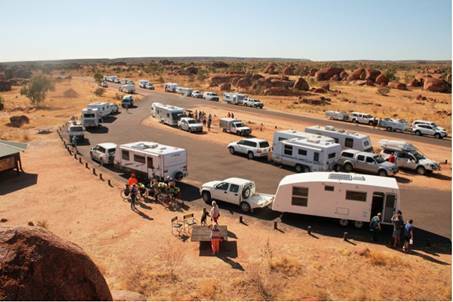 This is a photo of our vans gathering for a communal morning tea at the Devil’s Marbles. 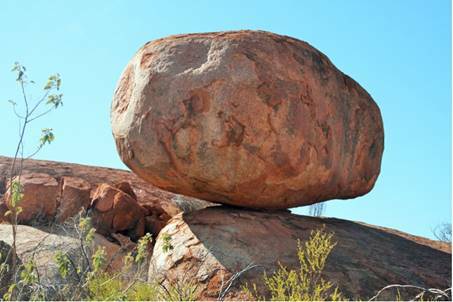 The Devil’s Marbles, just 100km south of Tennant Creek, were in keeping with the incredible scenery we we constantly enjoying. Geologically it is an incredible place to visit. 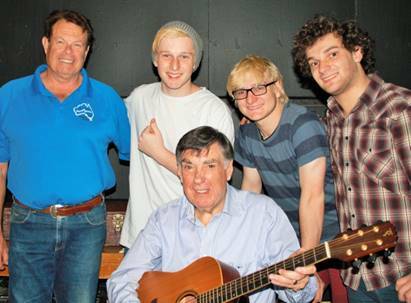 As a group we stopped for morning tea then continued down south where we would do two concerts on the next two nights. The night prior to us arriving, Warren H Williams had provided the entertainment. He was still there for our concert and accepted an invitation to join us. It was a fabulous night, one that I will remember for a long time. 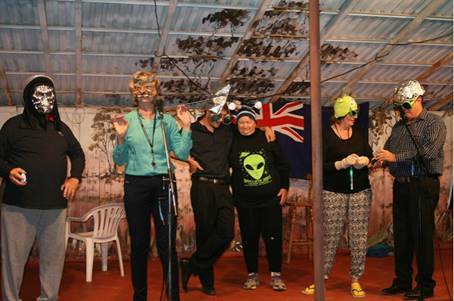 For a bit of fun we invited out tag-alongers to come dressed in an alien theme and started the concert with songs like “Monster Mash”, “Ghost Busters” and “My Friend the Witchdoctor”. 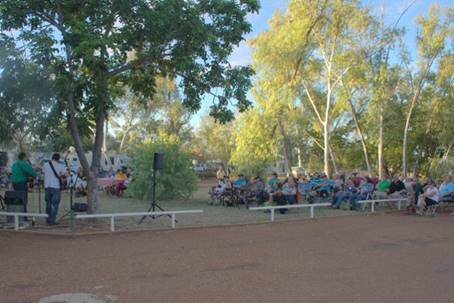 Our next stop was Alice Springs and concert No.14. 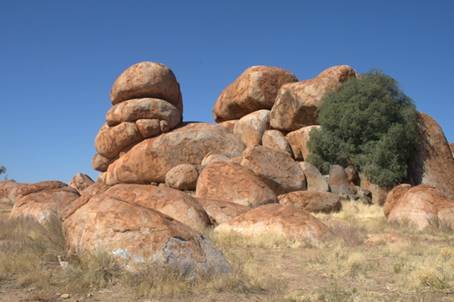 We were in Alice for three days, which was nowhere near enough time to see the many wonders of the area. 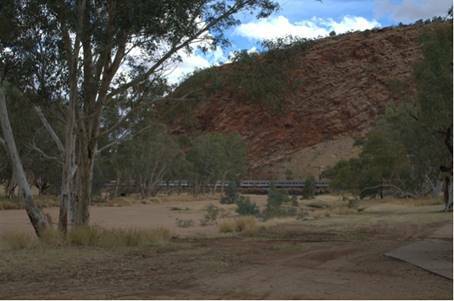 From the banks of the Todd River we watched the Ghan arrive through Heavitree Gap. 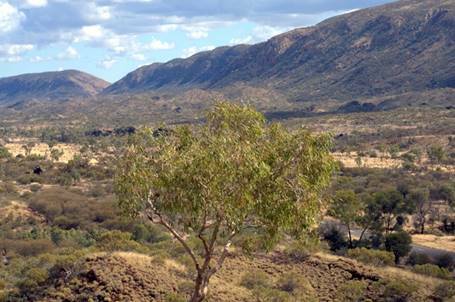 One excursion that we made sure we found the time to do was out to the MacDonnell Ranges. The scenery was mind blowing. 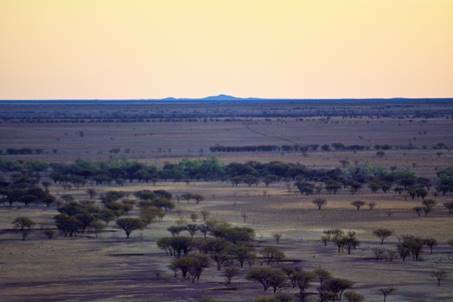 The experts believe that these rugged ranges that are now not much bigger than large hills were, some sixty million years ago, higher than the Himalayas. Arriving back at the caravan park late Monday afternoon we put on a very impromptu concert there and were asked if we could do something similar the following night to enhance a fund-raiser for a local four year old with a serious medical condition. It was my pleasure to accept this invitation and I thank my fellow entertainers and our tag-along members for their very generous response to an extremely worthwhile cause. 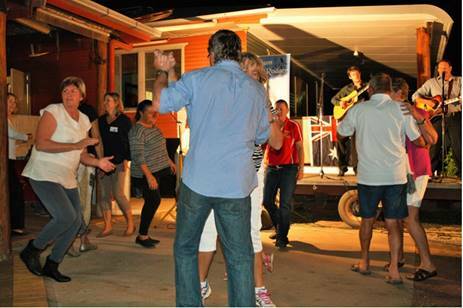 Ross River Resort became the venue for concert No.17 and the last two days of our tag-along. 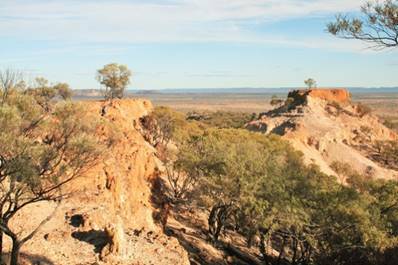 If you ever want to see spectacular scenery, you would be hard pressed to find anything more impressive than the hills and gorges out near the Ross River Resort. Concert No.17, our swan song for the tour. 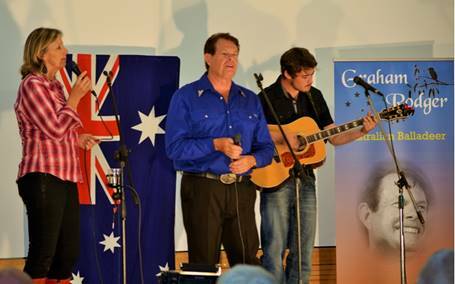 I would like to sincerely thank my fellow entertainers who helped to make this tour such a success as an Australian Country Music experience. Laura, Laurel, Rob and Trevor (aka ‘Biscuit’) I thank you. I have just spent the last four weeks with approximately ninety wonderful people and I thank them for their friendliness and cooperation over the last month. 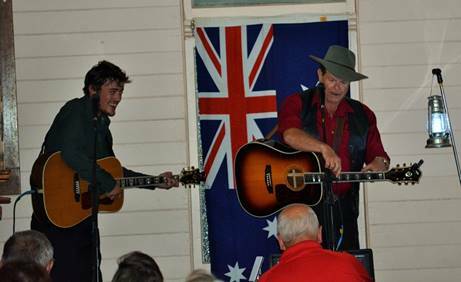 We were like-minded people, all loving Australian Country Music and all wanting to experience far-flung corners of this wonderful land. Tag-along 2015 has to go down as a major success. I don’t know what 2016 will bring at this point, but possibilities will be discussed and decisions made over the next couple of months. If you are interested, keep your eye on this website.